This is one incredible recipe! A summer campfire classic is reinvented into one memorable dessert! 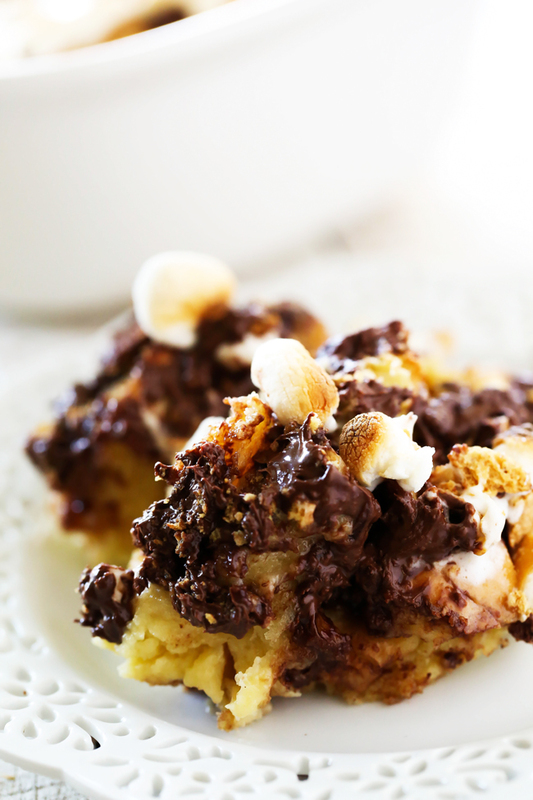 Gooey marshmallows, melted chocolate and graham cracker are packed into soft bread! Since then, I made a TRES LECHES BREAD PUDDING that has become very popular on my blog- and for good reason- it is amazing! 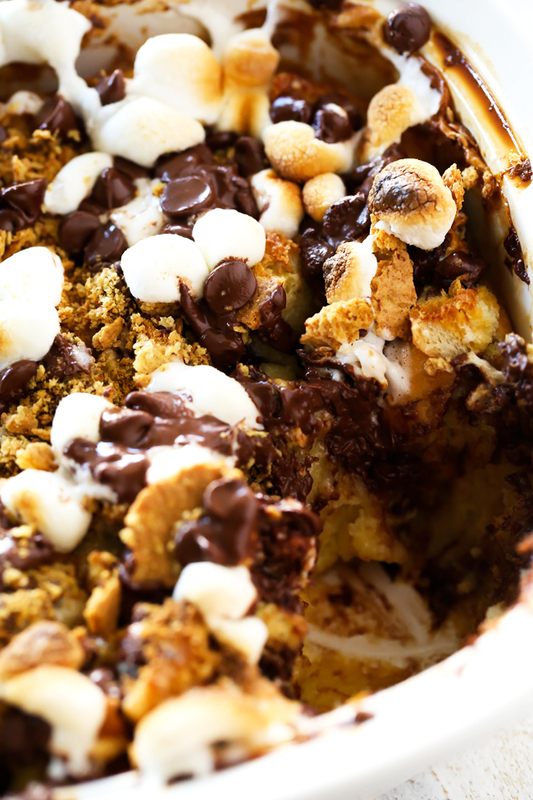 Today I would like to share yet another INCREDIBLE bread pudding with you and that would be, S’MORE BREAD PUDDING! Lets just break this down for a minute, shall we? Soft Bread that has been soaked in a delicious egg mixture (that has sweetened condensed milk in it), ooey gooey melted marshmallows, melty chocolate and graham cracker crumbs in every bite. This is the recipe for now show stopping, taste bud pleasing dessert! The campfire classic now in a fun new twist! Trust me, you are going to want to give this recipe a try! Spray an 8"x8' baking dish with cooking spray. Place French bread on a cookie sheet and and bake for 7 minutes until lightly brown. Place bread in the baking dish. In a medium bowl combine eggs, sweetened condensed milk, milk and vanilla and mix well. Sprinkle ½ of the marshmallows and ½ of the chocolate chips over the bread. Pour the egg mixture over the bread and lightly press the bread down to make sure all the bread is coated with the egg mixture. Let stand 5 minutes. Sprinkle ¾ of the graham crackers over the top and bake for 35 to 40 minutes until the egg mixture is cooked and the bread is not soggy. 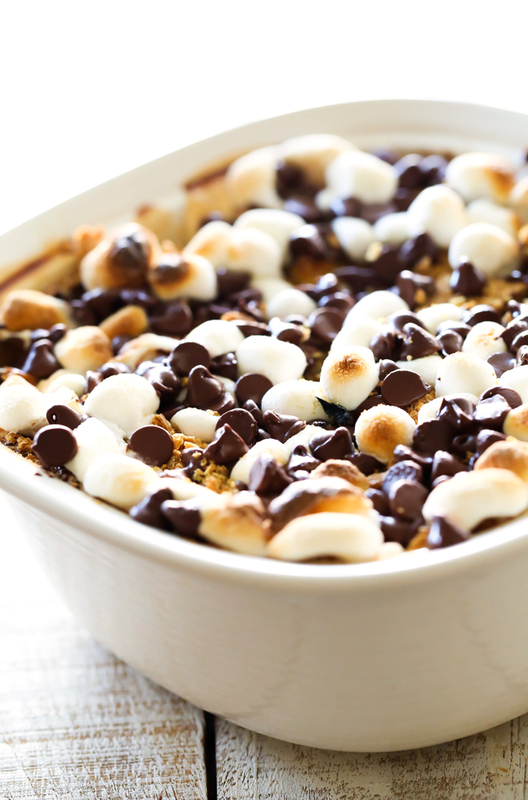 Sprinkle the remaining marshmallows, chocolate chips and graham crackers over the top and return to the oven until the marshmallows are toasted, About 5 minutes. Goodness .... literally!! This sounds so amazing and perfect for cooler weather! I think you just brought back summer along with Olaf with this recipe. Oh yum!